The epiphany came in the form of a Romanesque book which happened to be laying in front of me. There was I thinking how well met the Soave and I were with this handsome Italian volume (hardback, mind you) when I realized it was not the collectible it might have been, but merely a catalogue for the actual books on offer. The prices therein taught me the pathos that exists between actually browsing and simply gawking. So I gawked for a while. $25,000 for Sir Francis Bacon’s 1620 Novum Organum seemed a bit hard to swallow no matter how skillfully “the calf had been rebacked and recornered”; $100,000 for an eyewitness account of the Lincoln assassination by someone who had evidently only overheard it; a Gray’s Anatomy that cost an arm and a leg; a fine example of the cartographer’s art dating from 220 BG (Before GoogleMaps) of the western parts of Virginia, but you’d think for $150,000 you would get the whole state; and a rare Shakespear Third Folio which I suspect would have commanded even more than $500,000 had it been a handier size. You will appreciate from observations such as these that, having already disqualified myself as dealer, collector and browser, I also failed miserably as a serious gawker. In reality I was simply a curious visitor, and, as my area of curiosity is Oscar Wilde, I wandered over to a noted UK dealer of Wildeana who showed me something very curious indeed. “Take a look at this,” he said, after the chatty preliminaries, and he handed me a sheaf of typewritten papers bound at the corner. A brief examination was all that was required to know that the half-decent Oscar ephemera in my bookcase at home had not prepared me for what I now held in my grubby mitts. It was a typescript of the originally unpublished portions of Wilde’s passive-aggressive prison masterpiece De Profundis prepared by his literary executor, Robert Ross. Remarkable enough you might think, but that was only half the curiosity—for which typescript was it? It was not one one of the two original typescripts (or typescript and carbon copy) that Oscar asked Ross to have made after his release from gaol, both of which are lost. Nor was it one of the three extant typescripts Ross also made, probably for private circulation, which are housed in the Clark Library (of course). At least not unless the dealer has raided the Library vaults during its current refurbishment. Nor, again, was it the British Library Typescript identified by the Oxford University Press Complete Works as BLT-S, a designation that would warrant comment had I not already mentioned Bacon. From the cover we can infer that the TS was prepared at the time of the 1913 trial when Lord Alfred Douglas (Oscar’s lover Bosie) sued a young Arthur Ransome for having the temerity to imply that a person he did not name might have had a hand in Wilde’s downfall. 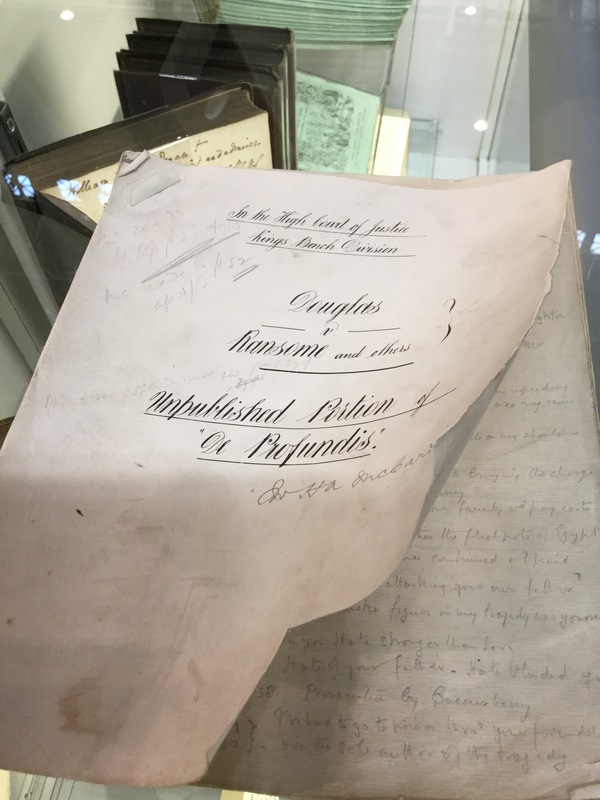 Ransome won the case because he was ably (and financially) supported by Robbie Ross, whose coup de grâce was to procure the original manuscript of De Profundis from where he had lodged it at the British Library. What I now beheld was a typed version of that letter provided by Ross for Ransome’s counsel to use during the trial, highlighting the previously expurgated portions of the text damaging to Douglas. The revelations came as a surprise to Bosie because back in 1897 he had thrown his copy on the back of the fire reading no further, I would suggest, than Wilde’s words “loathing” and “contempt” on the first page. For Bosie to hear home truths about himself in open court for the first time, sixteen years after previously ignoring them was a Shakespearean event. I was half tempted to dash back to that Third Folio with a red Sharpie to underscore the words hoist and petard which the Bard might have been coined for this very moment. Fortunately for bibliophiles everywhere, I was approximately half a million bucks shy of the asking price. Such was the mood of the trial which also included much impertinence from our litigious Lord who was continually rebuked by the judge for his attitude, and for initially being absent when Wilde’s damning letter was being read out. Who can blame him? More seriously, and more to Bosie’s credit, one interesting snippet emerged from the trial. Finally, let us return to the typescript. As a document used by the King’s Bench in the Ransome case, a King’s ransom was naturally the price tag. Again, the means escaped me. So I left the item to posterity with the encouraging news that an American institution had already expressed an interest in it. And so it has come to pass. Last week I learned that the typescript has been acquired by the Rare Book Department of my local Free Library of Philadelphia, meaning that I can have the thing near me after all without having to buy it. Those more remote will have to wait a little as it has not yet been cataloged. But when it is incorporated into the literary manuscripts collection it will be made available online. It will be worth checking out, if only to view the marginalia which includes case notes and a revealing footnote by Ross (suspiciously) exaggerating Wilde’s bankruptcy losses. In the meantime you can peruse my photographs on this page, and the other Wilde holdings at the Free Library. I assume that tomorrow’s jury will forever be out, on this matter – being that the dead – forever unable to truly defend themselves – appreciate your pursuits. As I do your articles. Thanks. Thank you for including photos. My hands shake at the thought of being near a humble typescript. I wouldn’t survive an original manuscript.